When you purchase music from the iTunes Store or upgrade tracks with iTunes Match, you receive an iTunes Plus file, which plays at 256 Kbps in stereo (128 Kbps in mono). However, iTunes also gives you the option of using a different encoder to compress music you import from other sources, such as a CD. Different types of audio file compression formats exist because each file format offers certain advantages. The three most popular types of audio file compression schemes used for saving audio as digital files are lossless, lossless compression, and lossy compression. Lossless audio files: The highest-quality audio files are called lossless because they never lose any audio data. As a result, lossless audio files offer the highest-quality sound, but they also create the largest file sizes. The two most popular lossless audio file formats are WAV (Waveform Audio Format) and AIFF (Audio Interchange File Format). Compressed lossless audio files: Lossless audio files take up large amounts of space, so compressed lossless audio files are designed to squeeze audio data into a smaller file size. Three popular compressed lossless audio file formats are FLAC (Free Lossless Audio Codec), Shorten, and Apple Lossless. Compressed lossy audio files: A lossy audio file compresses audio files by stripping certain audio data to shrink the file size. The greater the audio quality, the more audio data the file needs to retain and the bigger the file. The smaller the file, the less audio data the file can hold, and the lower the audio quality. As a result, most audio file formats strive for a balance between audio quality and file size. The amount of data an audio file format retains is measured in kilobits per second (Kbps). The higher the kilobits, the more data stored and the higher the audio quality. This table shows approximate kilobit values and the audio quality they produce. Compressing makes the file smaller so you can fit more songs on your personal listening device. AAC and MP3 encoders compress the data by removing audio you wouldn’t be able to hear unless you have bionic ears. AIFF, WAV, and Apple Lossless Encoders transform the data without removing any audio so it can be played on your computer or iPhone. One minute of CD-quality audio requires 10MB of storage. CD-quality audio is about 44,000 KHz per second with 16 bits of data over two channels for stereo listening. Here are the iTunes compression options and what they mean in terms of listening quality. To set your default import settings, go to iTunes→Preferences→General and click the Import Settings button. You have five choices, each of which has an Auto setting; four have custom settings, too. AAC (Advanced Audio Coding) Encoder: Offers better sound quality and more flexibility at the same bit rate as MP3. The Custom settings are iTunes Plus, High Quality (128 Kbps in stereo and 64 Kbps in mono), and Spoken Podcast (64 Kbps in stereo and 32 Kbps in mono). Files are compressed, and tags identify information about the song, such as artist, CD, and title. The AAC format offers a digital rights management (DRM) feature that allows copy protection; however, music you download from iTunes is DRM-free. AAC files typically end with the AAC or M4A file extension (if it does not have DRM) or the M4P file extension (if it does have DRM). AIFF (Audio Interchange File Format) Encoder: Custom settings let you choose a Sample Rate between 8,000 and 48,000 KHz; a Sample Size of 8 or 16 bit; and mono or stereo channels. AIFF and WAV offer the highest listening quality but don’t copy tag information, such as the name of the artist, CD, or song (although iTunes does track that in its database, it won’t show up if you burn to another CD), and the files are large because they aren’t compressed. 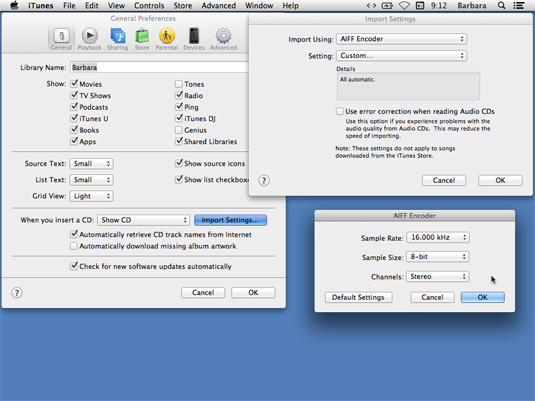 AIFF files can be read and created on iTunes on both Mac and Windows, but they are more commonly used in the Mac environment. Apple Lossless Encoder: Offers only an automatic setting. Apple Lossless compresses files without removing (or losing) any audio, so you have audio quality similar to AIFF/WAV but with slightly smaller files. It also sets tags like AAC and MP3 encoders. The downside is that most non-Apple devices don’t support Apple Lossless. MP3 Encoder: Choose Good Quality at 128 Kbps, High at 160, or Higher at 192. Custom settings offer Stereo Bit Rates between 16 and 320 Kbps; seven settings for Variable Bit Rate (VBR) encoding; ten choices for the Sample Rate between 8,000 and 48,000 kHz; mono or stereo channels; and normal or joint stereo mode. You also have an on/off option for Smart Encoding and Filter Frequencies Below 10 Hz. Files are compressed and tagged. This is the choice to make for non-iOS MP3 players or if you want to burn an MP3 CD to play in a portable CD player or car stereo. WAV Encoder: Offers the same custom settings as the AIFF encoder. iTunes on both Mac and Windows reads and creates WAV files. They are widely used with Windows and other operating systems. Although the iTunes app can’t add in audio that was removed — for example, converting an MP3 file to AIFF — iTunes Match does upgrade lower-quality tracks to iTunes Plus quality, making iTunes Match well worth the yearly $24.99 fee. Another advantage is that your audio files are then in the same format, and you need only one app to listen to your music.